In hopes of Achhe Din (Good Days) everyone has voted for Narendra Modi and helped him to win the election. Narendra Modi took oath as the Prime Minister of India three years back. Since then he started working for our country. A lot of work has happened in these three years. Not only Modi government even common man also started working for the country. Starting from submitting old currency note in a bank to unique identification Aadhaar lot of work is done by us 🙂 . It seems mantra of Modi Government is “Do work and Give Work”. Every day we hear something new from the Modi Government. Time will reveal that all these will bring good days or not. However, one thing is sure that work is started towards building “New India”. In this post, we will take a look at how the Modi Government has affected the stock market and our personal finances. The stock market has touched new highs since 2014. In the past three years, the Sensex and Nifty both have gone up by 9-10%. Economic and business sentiment became very positive after Modi has come to power. Sensex touched life time high. Top performing diversified funds have generated 20% to 30% returns in the past three years. It is estimated that in last 3 years of Modi’s government lot of investors have become a crorepati. More than 20 stocks gave over 1500% return. These include stocks like Ducon Tech, Kushal Tradelink, Uniply Industries, Fiberweb, Goyal Associates, Mangalam Drugs, Cupid etc. 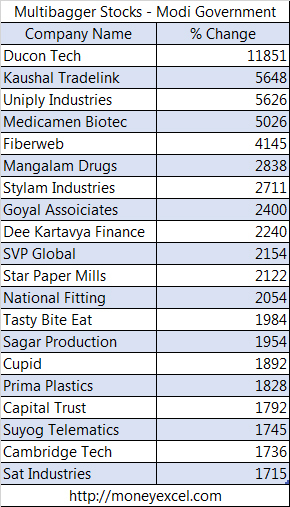 Around 500+ stocks have doubled investors wealth in last three years this includes a big name like Jay Bharat Maruti, Force Motors, MRF, Eicher Motors, Shree Cements, Page Industries, 3M India, Honeywell Auto, Wabco India, Tide Water Oil etc. In order to increase financial inclusion in rural area and for backward class Jan Dhan Yojana was launched under Modi’s era. This has helped lower income group to avail basic financial services like saving bank account, insurance and pension. The first unexpected shock from Modi Government was demonetization of Rs.500 and Rs.1000 notes. It is welcome step to curb a black money across country. Due to demonetization, we were forced to deposit idle cash into a bank account. We have started taking income tax law seriously and tax payer count in the country has increased. After demonization fixed income investments have become less attractive as interest rate went down. All of us are now diverted to mutual funds for investing our idle money. As black money is abolished , the rate of real estate has reduced significantly. Home loan interest rates have come down to make it easier to own a home. Affordable housing has given additional benefit to common man. A new initiative called as RERA – Real estate regulatory authority is launched and implemented at most of the states. This will give protection to real estate buyers. We started accepting new mode of transaction called as cashless. Paytm and Aadhaar Pay has become an integral part of our life now. Aadhaar has become mandatory identify document for everyone. We have enrolled for Aadhaar. Not only that we have linked our Aadhaar card with PAN Card, Bank account, Mobile and lot of other places. New Sukanya Samriddhi Yojana was launched under Beti Bacho Beti Padhao initiative. You can open Sukanya Samriddhi Account on the name of a girl child and save a lot of money for her future. UAN portal is launched under Modi’s government. Knowing EPF balance, Withdrawing EPF balance, downloading EPF passbook everything has become so easy for us now. The Indirect tax system is revamped and new single tax system called as Goods and Service Tax is introduced. This is towards one nation one tax. In addition to above Modi led government started 100+ such schemes like Pradhan Mantri Awas Yojana, Pradhan Mantri Garib Kalyan Yojana, Pradhan Mantri Jeevan Jyoti Bima Yojana, Digital India, Make in India etc. 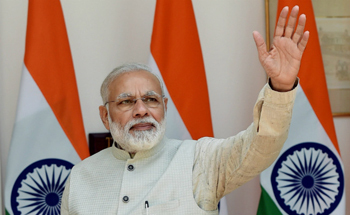 As per me, Prime Minister Narendra Modi is one of the best prime minister India has ever got. If you are in agreement with me, do share this post on your facebook and twitter page.